Trees are seldom perfect. This lodgepole pine tree standing alone in a clearing has damage from lightning or wind, or both. The sunset gives a feeling of late-day calm, contrasting the violence that shattered the top of the tree. 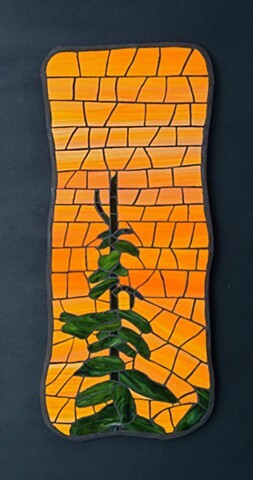 I chose to do this image on a curved substrate, something I was influenced to do by the works of Barcelona mosaicists Antonio Gaudi and Jesus Maria Jujol.